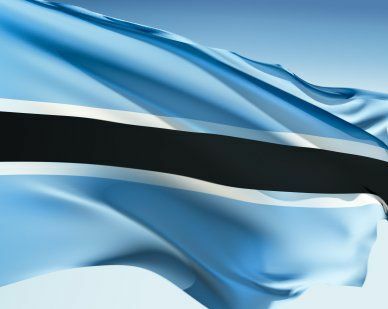 Adopted on September 30, 1966, the national flag of Botswana features a light blue background and horizontal black and white stripes. The color blue symbolizes rain, as the Botswana coat of arms features the motto, “Pula,” which is the Tswana word for, “Let there be rain.” The white and black strips represent racial harmony as well as the zebra, which support’s the nation’s coat of arms. Our top-quality Botswana flags conform to all official specifications. Emblems and designs are executed with the highest possible degree of accuracy in regard to detail, color shades, placement and proportion to flag size.